The most recent Nail Art Society kit is called The Great Glitzy and it is a collab with Floss Gloss. In the kit, you will receive Floss Gloss' Dimepiece or Stun, a pot of glitters (either silver or gold, depending on which glitter polish you received), a baggie of rhinestones and pearls, and an orange stick. I received Dimepiece and this is the look that I came up with. I love it! It's so sparkly and glitzy and pretty! thanks Jessica :) I only used one coat of Dimepiece, it covers so well! 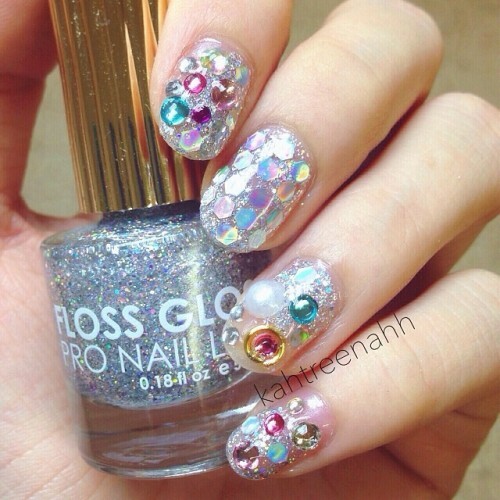 So sparkly and cute! Such adorable mani!